Remember when Sean Connery’s James Bond reinvents himself as a Japanese man in You Only Live Twice? That – and he’ll like this analogy – is what another James is in the process of doing in Tokyo, where he now lives and plays his rugby, at least for the next couple of months, writes Ian Stafford. England back-rower James Haskell was last seen wearing the white jersey of his country from the bench as his efforts came to nothing in the losing World Cup quarter-final against France in Auckland on 8 October. He spent a couple of weeks in England sorting himself out before flying to Japan to begin a spell with the Ricoh Black Rams, which will end, he hopes, with a run in Japan’s Top League end-of-season play-offs, before then heading south to Dunedin to feature for the Highlanders in what will remain of the Super Rugby tournament. And so our wandering minstrel continues his rough guide to rugby cultures, having played club rugby for the last two seasons in Paris for Stade Français. In the French capital he embraced life on and off the pitch, buying his morning baguette and sipping tar-black espressos, and it seems he is doing the same in Tokyo. In moving to Tokyo and then travelling on to Dunedin, where he played in England’s first three winning World Cup group games at the enclosed Otago Stadium, Haskell has willingly turned his back on further Test appearances for England, at least until he returns to former club London Wasps next season. Yet there is an understandable method in his madness. He says: “I wanted to return to the Premiership after being away for two years, but not this season, not after a World Cup. It would have meant joining a new club in November, some two months into the new season, and I didn’t fancy that. “Besides, I see myself at the halfway stage of my career. It’s a natural point to travel a little, experience more culture and a different approach to life and rugby, and grow up before knuckling back down to rugby in England. Where else could I play some rugby for just three to four months before fulfilling my dream of playing in the Super 15 for a New Zealand side? A World Cup winner with New Zealand, centre Nonu is the Rams’ most high-profile signing, followed by Haskell, who knows Holden from his time at Wasps. It was Holden who contacted his former player just as Haskell was contemplating a move to another French club. “It’s given me the chance to be a senior player for the first time in my life, and it’s a chance I’ll relish,” Haskell continues. “I want to take some responsibility and be seen to be leading by example. I’m not entirely sure I can be previously accused of either of these things. I know I’ve been perceived to be a bit of a joker and not really England captain material. To prove his point, Haskell has set up a post-training ‘Tackle Club’ in which he coaches his team-mates in the art of tackling. “It’s going well and it’s just an example of how I’m taking my role very seriously,” he says. 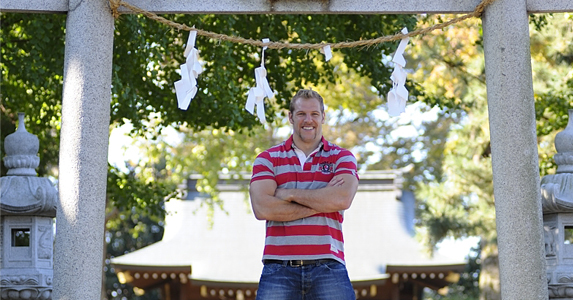 The arrival of players in the prime of their careers, like Haskell, is a boost for Japanese rugby. The Top League features 14 teams, all seemingly backed by corporate conglomerations such as Toshiba, Coca-Cola and Haskell’s own Ricoh Black Rams. And Japan’s national team gave a decent account of themselves at the World Cup in New Zealand. In a difficult group featuring both eventual finalists, they scared France, drew with Canada, suffered a narrow defeat by Tonga and were dealt a thrashing by the All Blacks. The country is now looking forward to staging RWC 2019, which, judging by the success of the football World Cup in 2002, shared with South Korea, should prove to be a triumph. 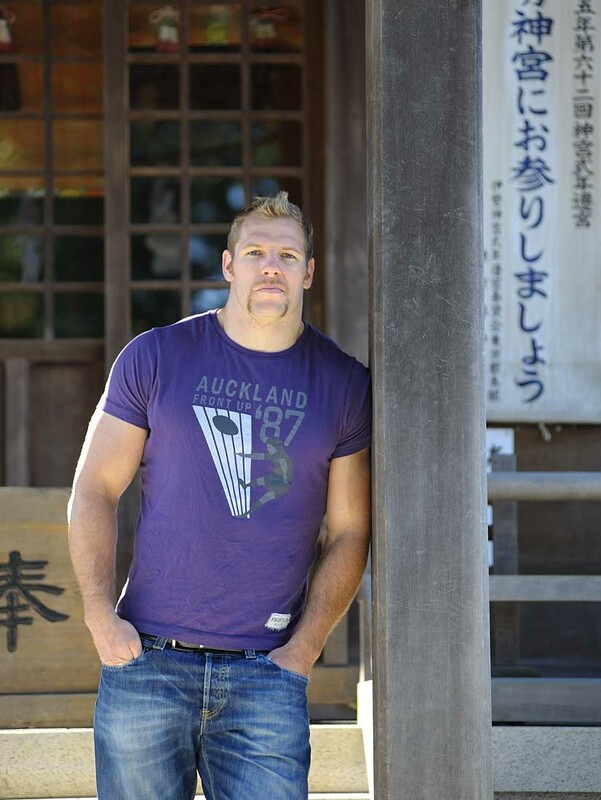 “In terms of infrastructure, Japan’s definitely got what it takes to not only stage a wonderful World Cup but also improve as a rugby-playing nation enough to become a competitive nation on a world stage,” Haskell insists. Over the next few weeks Haskell, who will travel to some away games on Japan’s super-fast bullet train, hopes to experience much more of his new home’s way of life. The regular Top League season ends in February, but if the Black Rams make the play-offs, Haskell will stay longer before heading to New Zealand. When he arrives in Dunedin he hopes to force his way into the Highlanders’ starting XV and feature in some Super Rugby games. Highlanders coach Jamie Joseph, the former All Black and Japan flanker, met up with Haskell during the World Cup and had conversations with Martin Johnson, who also played some rugby in New Zealand, before making an offer. “It’s probably the smallest contract I’ve ever signed but that’s not the point,” Haskell explains. “I’ve always wanted to play in the Super 15. Only Danny Cipriani’s done it from England and he’s in Australia. My dream was to play for a New Zealand team and now it’s going to come true. “When you speak to Johnno he’ll tell you that playing in New Zealand was one of the best things he ever did in his career. I’m hoping I’ll be saying the same. It can only improve me as a player and as a person. Having played in London, Paris and now Tokyo, I can assure you that Dunedin will be very different and considerably quieter. It will be rugby, rugby, rugby. Whilst he plays in Japan and New Zealand, the Six Nations will be taking place, in which England, minus Haskell, will start the rebuilding process after a disastrous World Cup. With flanker Lewis Moody retired and question marks over Nick Easter’s long-term role at the back of the scrum, Haskell, who was one of England’s better forwards in New Zealand, will miss an opportunity to cement his place in a new-look side under a new coach following Johnson’s resignation. “It’s a calculated risk but one I’m prepared to take to make me a better player and person. Playing for my country means everything to me. I like to think I played well in the World Cup and I’ll hate watching the Six Nations. I accept that by playing abroad I could have played my last game for England at the World Cup, but I’m hoping this isn’t the case. There may even be people who will be happy to see the back of me but I’m not planning it to end that way. Before all that Haskell has the small matter of leading the Ricoh Black Rams to success in Japan before taking on the full might of the southern hemisphere. Can a leopard really change his spots?